Photo by Stefan Tan. Creative Commons BY-NC-SA (cropped). 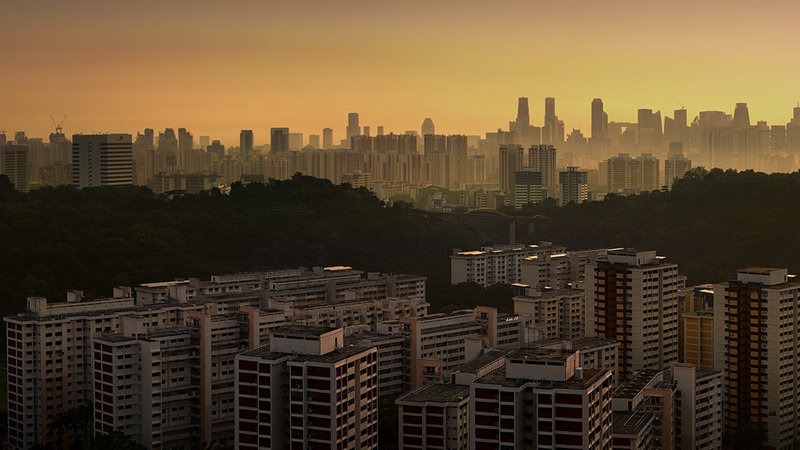 With a population of five million crammed on a landmass of just 715 square kilometres, the tiny republic of Singapore has been forced to expand upwards, building high-rise residential complexes to house the country’s many inhabitants. Now Singapore is applying the vertical model to urban agriculture — experimenting with rooftop gardens and vertical farms in order to feed its many residents. Currently only seven percent of Singapore’s food is grown locally. The country imports most of its fresh vegetables and fruits daily from neighbouring countries such as Malaysia, Thailand and the Philippines, as well as from more distant trading partners like Australia, New Zealand, Israel and Chile. An influx of immigrants has resulted in a rapid crowding of Singapore’s skyline, as more and more towering apartment buildings shoot up. And meanwhile, what little land was available for farming is disappearing fast. 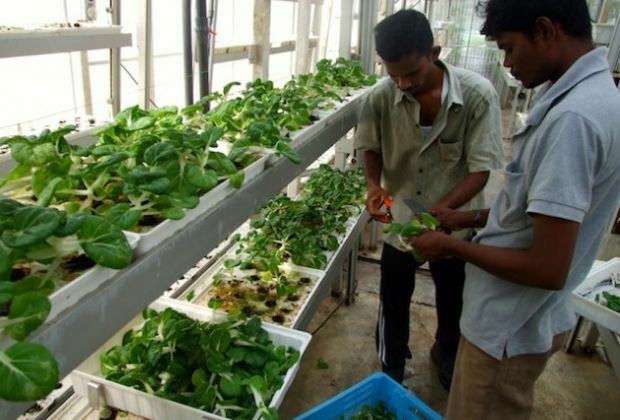 The solution to the problem came in the form of a public-private partnership, with the launch of what has been hailed as the “world’s first low-carbon, water-driven, rotating, vertical farm” for growing tropical vegetables in an urban environment. The result of a collaborative agreement between the Agri-Food and Veterinary Authority of Singapore (AVA) and a local firm, Sky Greens, this venture aims to popularise urban farming techniques that are also environmentally friendly. A Sky Green farm tower. Photo: Kalinga Seneviratne/IPS. With a robust economy that boasts a gross domestic product of 239.7 billion dollars, Singapore has plenty of money. “But money (is) worthless without food,” according to Sky Greens Director Jack Ng. “That’s why I wanted to use my engineering skills to help Singapore farmers to produce more food,” Ng told IPS. 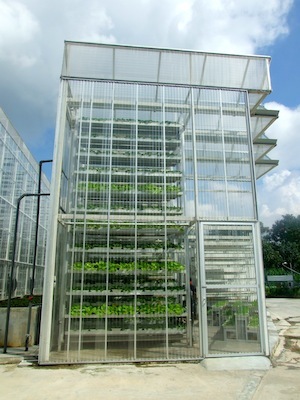 An engineer by training, Ng created the vertical farming system, which he nicknamed ‘A Go-Grow’. It consists of a series of aluminium towers — some of them up to nine metres high — each containing 38 tiers equipped with troughs for the vegetables. 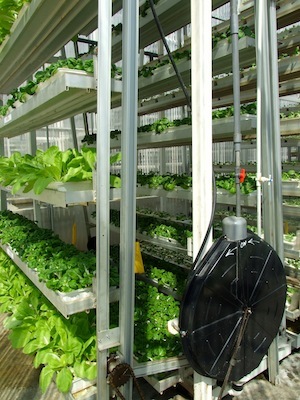 In keeping with Sky Greens’ focus on environmental sustainability, the water used to power the rotating towers is recycled within the system and eventually used to water the vegetables. Each tower consumes only 60 watts of power daily — about the same amount as a single light bulb. Ng knew that if the system was too expensive or complicated, urban farmers would not be able to survive. And given that he designed the project with retirees and other housebound farmers in mind, he tried to create a situation in which “the plant comes to you, rather than you going to the plant”. The multi-layered vegetable tower rotates very slowly, taking some eight hours to complete a full circle. As the plant travels to the top it absorbs ample sunlight and when it comes back down it is watered from a tray that is fed by the hydraulic system that drives the rotation of the tower. This closed cycle system is easy to maintain and doesn’t release any exhaust. Ng says that such towers — if set up on roofs of the many multi-storey residential blocs that house most of Singapore’s population — could provide livelihoods for retirees and housewives, who would only need to spend a few hours up on the roof to attend to the system. Sky Greens towers currently produce three vegetables popular with locals — nai bai, xiao bai cai and Chinese cabbage — which can be harvested every 28 days. Workers harvesting vegetables from one of Sky Green’s vertical towers. Photo: Kalinga Seneviratne/IPS. They already supply NTUC FairPrice, Singapore’s largest grocery retailer, that has a network of over 230 outlets and supermarkets. The urban-grown vegetables cost roughly 20 cents more per kilogramme than the imported varieties. The group’s purchasing manager, Tng Ah Yiam, recently told a Straits Times reporter that these ‘sky farms’ are now able to offer their customers quality, locally-grown vegetables “that are fresher because they travel a shorter distance from farm to shelf”. Sky Greens plans to supply two tonnes a day to NTUC by the middle of next year when they expand their farm towers. The Sky Greens project feeds into a trend that has been underway in Singapore for several decades. Since the urban expansion of the 1990s Singapore has attempted to respond to the scarcity of land available for traditional cultivation by promoting rooftop vegetable gardens. A number of local institutions developed hydroponic and aeroponic cultivation systems but none ever took off. “There was always concern over whether or not the rooftops could take the weight of these structures,” Shih Yong Goh, former Head of Public Affairs at AVA, told IPS. Experts like Lee Sing Kong, Director of the National Institute of Education and a long-time advocate of the use of ‘sky farms’, believe there is an urgent need for Singapore to become less dependent on food imports. Given the increasing frequency of extreme weather events, including “natural disasters such as flooding, which could impact food production, it may be necessary for Singapore to look at producing some of its own vegetables from the food security point of view”, he told IPS. Kong said that he is currently involved in the development of ‘vegetable factories’ — whole buildings designed to grow fresh produce. Since 2005, the government has shed some of its reservations about rooftop production. The National Parks Board recently converted the rooftop of a multi-storey residential building in the densely populated Upper Serangoon Road into an educational farm to promote urban agriculture among school children. Meanwhile, Sky Greens has signed an MOU with Singapore’s Temasek Polytechnic technical college. Dr. Lee Chee Wee, Director of the School of Applied Science, believes that partnering with Sky Greens will expose his students to how technology is used in vegetable farming and make “modern farming so much more attractive as a career choice for our graduates”. Copyright Inter Press Service. All rights reserved. hi, my name is Law Kher Choon from LimKokWing University. I’m having a final project which is urban farming, located at Petaling Street,KL. Would you like to tell me the programs of urban farming, such as how it works, or what space we needed, or maybe the space needed to produce the amount of vegetation,please?